We are way into the swing of being back at school since we went back to school mid-August. Aria is into her second year at Primary school and is loving it. She loves the learning and she loves seeing friends every day. It is so good when they enjoy being at school. School is a huge part of her life, so when doing the usual Christmas tradition of looking through the Smyths Toy Catalogue she came across this fantastic Our Generation Awesome Academy set and knew this was what she’d like from Santa. And who wouldn’t? It looks awesome as it suggests. I can understand why she picked this and she’s a huge fan of dolls too. This is perfect for her. 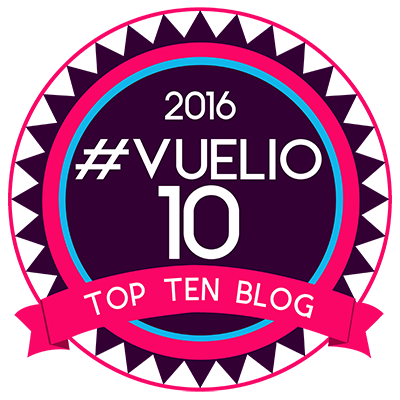 Find out what we think of this by reading on. This set has a high price tag of £149.99, but when you see everything that comes with it, I think you’ll understand why. I certainly think it’s good value for money and can’t wait to see her face when santa delivers this under the tree. 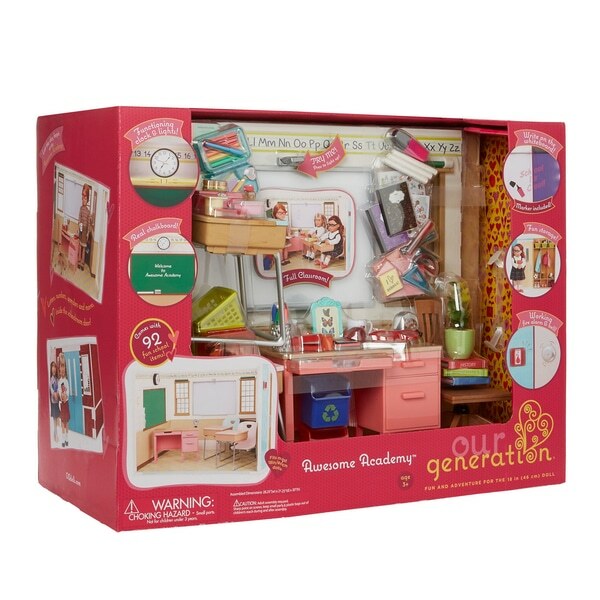 The Our Generation Awesome Academy is easy to assemble, it can be done quickly and it is good quality, sturdy and will withstand hours of play. The playset has three walls and a floor which setup the school room itself. There are two pupil desks with chairs and a teacher desk. Meaning this set can grow as your little one does with more dolls and you could add to it. It even has lights that work, a clock that ticks and bells that ring. There is a chalkboard and chalk as well as a whiteboard and marker. All the things they will find in school. This set has oodles of accessories, a total of 92 in total. Yes, 92. They have really thought of everything any little boy or girl would find in their classroom and added it in for their playtime enjoyment. This set is perfect for allowing little ones imagination to play schools at home, they will just love the role playing element and being able to be the teacher or the pupil. Everything you would need comes in this set, but it doesn’t come with a doll. The accessories and attention to detail is what stands out in this set from little mini pencil cases filled with stationery to lunch boxes with pretend lunch. The light on the whiteboard light up and the teachers chair even spins. There are even attendance cards and teacher records for when they want to play teacher. There are shelves and storage bins to keep all these little accessories safe. I could go on and on about how much this set covers. As I mentioned above, The Our Generation Awesome Academy doesn’t come with a doll, so I have been looking at dolls to go with this set. I think the one I’d pick is Our Generation April. Mainly because she has ginger hair like Aria and she looks great. She is poseable and would go perfectly with this set. There are loads of dolls in this range, I am sure there is something that will suit everyone. The dolls look like little girls which is what I love about them. 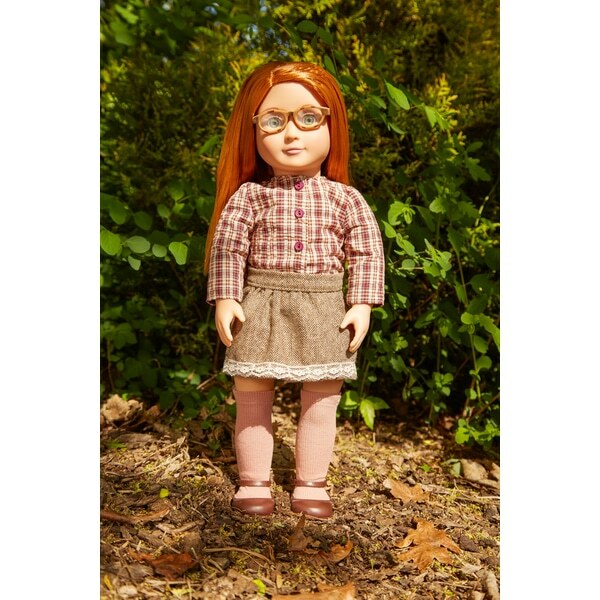 The dolls have an RRP of £26.99 and I think this is good value with their size, posing ability and the quality of their clothes. I look forward to playing with these with Aria. Our Generation has lots of different clothing and accessory kits for their dolls. This is the one I’d pick to go with the school set this Christmas. This is the Our Generation Deluxe School Uniform Outfit at £12.99 again good value I feel. It comes with the clothing and looks a bit like Aria’s tartan pinafore too. So we have a perfect little mini-me doll. This set even comes with the school bag and accessories. It is the first time I have come across the Our Generation range and Aria is at a perfect age for them, she’s currently 5 and will be 6 not long after Christmas. There are loads of sets in the range perfect for gifts for this Christmas, from Horse sets, bunk beds, cars, wheelchairs and boy dolls too. This range has it all. Well made and will last for years. We look forward to exploring more of this range. Which one is your favourite in Our Generation range or are you new to it like us? Disclaimer:- We were sent this set and also a gift card in exchange for this post, but all thoughts and opinions are my own. My youngest has seen this set and has fallen in love with it. All the little accessories are fantastic! We love these sets, or shall I say I do. My daughter is way past the doll phase now so no excuses to purchase for her. However I’m a childminder, so that’s a good enough excuse. She will absolutely love it. My daughter is 6 and has been into Our Generation for about 18 months, we add to it every Christmas and birthday. It’s an excellent quality range and really good fun. 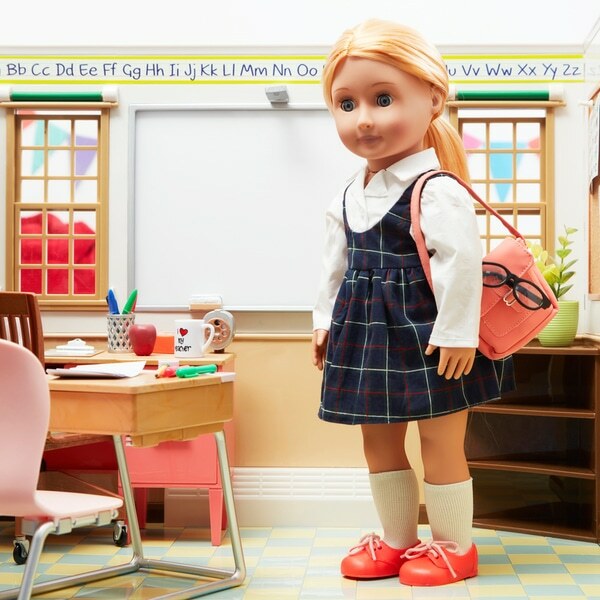 She has the Academy set on her Christmas list as she loves to play school with her dolls.